This entry was posted in News and tagged download, physically based shading by christian. Bookmark the permalink. Thank you for shar­ing these slides, best artists-ori­ent­ed slides I have seen on the sub­ject! Def­i­nite­ly use­ful for train­ing artists with­out tech­ni­cal back­ground. 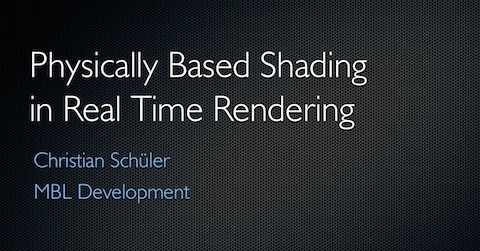 I real­ly love the idea of phys­i­cal­ly based shad­ing in a real time engine! I just would love to know, how to acti­vate this mod­el in an engine? More spe­cif­ic, how do i enable this type of mate­ri­als in the cryengine and in the unre­al engine? the slides con­tain links to the online doc­u­men­ta­tion of either CryEngine and Unre­al where this is described. In CryEngine, accord­ing to their docs, it is acti­vat­ed when the spec­u­lar tex­ture con­tains an alpha chan­nel. In Unre­al it is avail­able togeth­er with ‘image based reflec­tions’ and has to be enabled with a spe­cial check box next to it. Hi Mar­ius I tried PDF, but it seems that Keynote gen­er­ates PDFs that con­tain each slide as a large image. It is more than 50 MB so I did­nt put it online. thank you for your great pre­sen­ta­tion at the fmx. You’re wel­come Stephan was nice talk­ing to you. Thank you so much for shar­ing this! I thor­ough­ly enjoyed your pre­sen­ta­tion at FMX and wish you had even more time to deliv­er it as I was so cap­ti­vat­ed, so I’m incred­i­bly hap­py to find it here! Also, as a fresh faced VFX stu­dent who is con­sid­er­ing spe­cial­is­ing in the lighting/shading/texturing area in future, I thank you for hold­ing back on the tech­ni­cal speak; I learned a heck of a lot from your pre­sen­ta­tion because it was so visu­al and easy to fol­low, and I was pleased to find that I retained the infor­ma­tion which helped me under­stand a lot of the oth­er pre­sen­ta­tions I attend­ed at FMX. I found your pre­sen­ta­tion to be one of my per­son­al high­lights of the con­fer­ence, so thank you and I hope you come back anoth­er year to enlight­en me more!